Thread: Less Work Less Mistakes ! This allegory smugly fits the Bank I am referring, like a levis Pants to the young and attractive. A few days ago, my father in law (FIL) about 82 years , went to the branch of his Bank, a nationalised Bank, to enquire about online Banking account. My FIL is not net savvy, but he thinks otherwise. He has a smart phone, high end. That was enough for him ! Added to this, my son, installed a plethora of social network applications like Whatsapp, Skype and lured him to use online net banking application. If you can do online chatting in Whatsapp, you have mastered technology! Thats all ! That is my FIL's considered view ! He is The starting point for this short story ! “Why Grand pa, you go in the hot sun to the Bank?”. That clinched !, My father in law decided to install online Banking in his Smart phone. More importantly, The branch had recently installed a self service Pass book printing machine, in the middle of the hall. It appears, may be destiny, whenever my FIL tries to update his Pass Book, the machine refuses and goes out of order . Is it not Professor Murphy said “If anything can go wrong -- it will” . Adding insult to the injury, my FIL , being hard of hearing, could not decipher what the machine says ( Interactive system). To make things worse, Poor eye sight, so he can't read what the machine blinks!. He has creaking legs, so he cannot stand long in the serpentine queue. So, He decided to bring the bank to his home through the smart phone. Incidentally, He had large deposits in the Bank and periodic interest credited to his account. At this twilight zone, he had all the time in the world to go through the pass book statements and check things over and over meticulously. He takes pleasure in finding mistakes and tormenting Bank assistants with his knowledge queries! So my FIL , escorted by my wife for noise or voice amplification, was sitting in the Branch Manager’s cabin. The Branch Manager beamed and said, “Why don’t you come in the evening!, when the counter is free! . I will get the kit from the counter! “. In a nationalised Bank, you should not get a job done in one go ! That is the unwritten rule ! Evening about 4.00 pm , when my FIL accosted the counter clerk, the assistant said “ We have no stock ! Come after 15 days “. After my wife’s repeating this to my FIL in high decibles , FIL whined “Your Manager said he will give it in the evening!” The assistant promptly responded, “You should have asked me instead of him! ” a bit nonchalant, I –don’t –care-what –the-BM-says attitude. Always it is the fault of the customer, never his ! My FIL returned empty handed . All his hopes of meddling with the application in the mobile dashed! Now he has to go and plead the assistants or cajoling the lousy machine for getting the pass book updated. While this drama was on, My wife, sitting next to FIL , was eavesdropping the conversation of another old couple in the adjacent counter. “ Sir my ATM card is not working!” The senior citizen customer was complaining. The couple left slowly , accompanied by a crackling joint and hip , disappointed look on their face ! My FIL and my wife also returned the same way, empty handed. The matter does not end here..... ! I was relaxing ! Evening snacks time ! Those who have grit and health, will enjoy “Pakoda” . Not for me! I have crossed that young and energetic stage ! It is just some lousy Biscuits and tea ! My wife narrated the episodes. She was unhappy about the customer treatment at the Branch! I was feeling sorry for the disappointment of my FIL. However, My worry was different, I have not used my Bank ATM card for the past one year or So. Is it possible my card is blocked? What will happen if I decide to use it? Why not I check? Next day morning, after coffee, I went straight to the Bank's ATM. I tried to withdraw, Surprise! it worked. I took the money and turned. I could not understand why the card was not blocked? Is it possible, the assistant bluffed the customer ? I had no clue ! While returning I noticed two things ! 1. One of the two ATM was out of order ! 2. No watchman. Usually, there used to be a watchman! I remembered earlier occasions also, when I was crossing the street, I saw no watchman ! My imagination went disarray ! Is it the reason, in some late nights, the ATMs were closed with an “Out of Order” sign board? Is it possible, the Air-conditioned ATM is used as a free shelter for the wayward junkie in the nights? I was under the impression, complaints are a clear indicators of weakness and/or failure - in other words operational risk assessment carried out by customers. The complaints provide a new opportunity for product development and adaptation. I tried to contact the toll free number.Ringing ………….Ringing………Ringing. I slammed the phone. This is how the nationalised Bank takes the complaints and views of the customers. 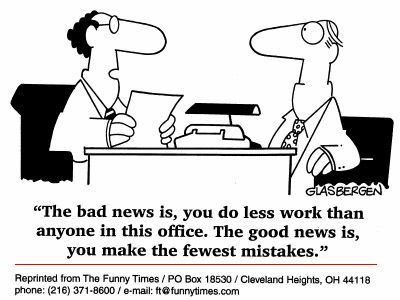 They must be taking a view "Less Work Less Mistakes !" Now we come to the top of the story. Read the first paragraph “The board in front of the building says “Lakshmi Electricals : We repair all types of electrical appliances and instruments. Low charges, Quick Delivery, Quality Guaranteed ”. A small note below that advertisement says “ Please bang the door, if closed : The calling bell is not working for the last few days"
Last edited by Muralidharan S; 1st May 2016 at 09:39 AM.